Strange sisters (but sisters none the less!) 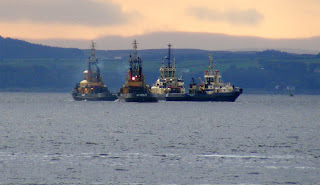 naval support tugs SD Impetus, SD Impulse together with Svitzer tugs Ayton Cross and Svitzer Mallaig await the arrival of Mathilde 03 September 2008. Kindeace is not currently on the Clyde (Warrior III?) so the merchant tugs are maybe a bit outnumbered (Mathilde is over 160 000 tonnes DWT! ).